The ideal today is “democratic policing,” a concept developed by scholars like Gary T. Marx at MIT. Broadly, this refers to a police force that is publicly accountable, subject to the rule of law, respectful of human dignity and that intrudes into citizens' lives only under certain limited circumstances. The 20th century has seen a slow but steady integration of minorities and women within police forces. Different managerial models aimed at improving relations with citizens have also influenced policing over the last 40 years. The most prominent among these are community-oriented policing , problem-oriented policing and intelligence-led policing . However, in disadvantaged, multi-ethnic neighborhoods, police presence and activity are often more intense . They are there to target crimes that have been identified as priorities by police leadership and elected officials. In fact, one policing model, predictive policing , can exacerbate racial tension between law enforcement and African-American communities. 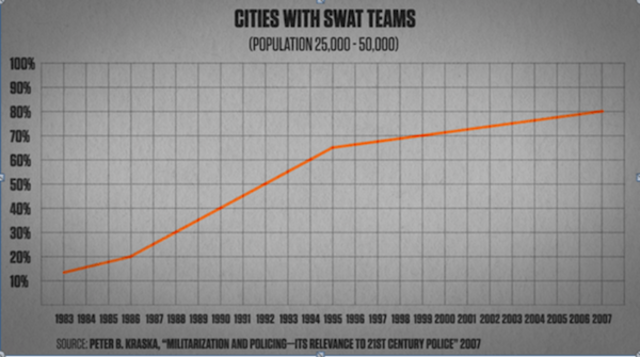 As a result, we have seen a booming of SWAT (Special Weapons and Tactics) teams: 80 percent of cities with 25,000 to 50,000 inhabitants now have a SWAT team. From the late 1990s, through the 1033 Program , the Department of Defense has authorized the transfer of military equipment to police departments across the country. Since 2006 the police have bought 93,763 machine guns and 435 armored cars from the Pentagon. All this has only heightened the real and perceived potential for deadly force by police officers. Police agencies now have access to a vast network of closed-circuit television (CCTV) monitors, allowing the surveillance of public and private spaces. Just to give a few numbers, the Chicago Police Department has access to 17,000 cameras, i ncluding 4,000 in public schools and 1,000 at O’Hare Airport .